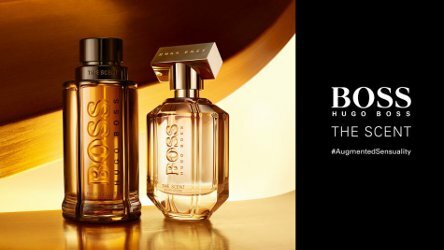 Hugo Boss has launched Boss The Scent Private Accord and Boss The Scent For Her Private Accord, new flankers to 2015's Boss The Scent and 2016's Boss The Scent for Her, respectively. The Scent Private Accord ~ "Magnetic cocoa absolute vibrates at the heart of BOSS The Scent Private Accord for Him while notes of ginger and exotic maninka fruit combine with sophisticated mocha." In Eau de Toilette. The Scent Private Accord for Her ~ "Addictive cocoa absolute pulses at the heart of BOSS The Scent Private Accord for Her, while the freshness of sweet mandarin and captivating osmanthus contrast with warm tonka." In Eau de Parfum. Boss The Scent Private Accord and Boss The Scent For Her Private Accord are available in 50 and 100 ml. For her sounds intriguing. Will sniff if I come across it. Anything with osmanthus is worth a shot to me (seems like I said that within the last few days, so there must have been another one)!